We had 62 named registrations, 7 guest additions and approximately 10 offline participants prior to the event day. Most interestingly the organisation of the GWAB through the MSCC helped to increased the number of craftsmen. The Mauritius Software Craftsmanship Community has currently 138 registered members - in less than one year! Only with those numbers we can proudly say that all the preparations and hard work towards this event already paid off. Personally, I'm really grateful that we had this kind of response and the feedback from some attendees confirmed that the MSCC is on the right track here on Cyber Island Mauritius. Inspired and motivated by the success of this event, rest assured that there will be more public events like the GWAB. "Wow, what an experience to organise and participate in this global event. Overall, I've been very pleased with the preparations and the event itself. Surely, there have been some nicks that we have to address and to improve for future activities like this. Quite frankly, we are not professional event organisers (not yet) but we learned a lot over the past couple of days. A big Thank You to our event sponsors, namely Microsoft Indian Ocean Islands & French Pacific, Ceridian Mauritius and Emtel. Without them this event wouldn't have happened - Thank You! And to the cool team members of Microsoft Student Partners (MSPs). You geeks did a great job! Thanks!" So, how many attendees did we actually have? 61! - Awesome - 61 cloud computing instances to help on the research of diabetes. The overall feedback is positive but we are absolutely aware that there quite a number of problems we had to face. We are already looking into that and ideas / action plans on how we will be able to improve it for future events. We started the day with welcoming speeches by Thierry Coret, Sr. Marketing Manager of Microsoft Indian Ocean Islands & French Pacific and Vidia Mooneegan, Managing Director and Sr. Vice President of Ceridian Mauritius. The clear emphasis was on the endless possibilities of cloud computing and how it can enable any kind of sectors here in the country. Next, Arnaud gave a brief overview of the variety of services Windows Azure has to offer. Whether you need a development environment for your websites or mobiles app, running a virtual machine with your existing applications or simply putting a SQL database online. No worries, Windows Azure has the right packages available and the online management portal is really easy t handle. After this, we got a little bit more business oriented while Wasiim Hosenbocus, employee at Ceridian, took the attendees through the inerts of a real-life application, and demoed a couple of the existing features. He did a great job by showing how the different services of Windows Azure can be created and pulled together. After the lunch break it is always tough to keep the audience awake... And it was my turn. I gave a brief overview on operating and managing a SQL database on Windows Azure. Well, there are actually two options available and depending on your individual requirements you should be aware of both. The simpler version is called SQL Database and while provisioning only takes a couple of seconds, you should take into consideration that SQL Database has a number of constraints, like limitations on the actual database size - up to 5 GB as web edition and up to 150 GB maximum as business edition -, among others. Next, it was Chervine Bhiwoo's session on Windows Azure Mobile Services. It was absolutely amazing to see that the mobiles services directly offers you various project templates, like Windows 8 Store App, Android app, iOS app, and even Xamarin cross-platform app development. So, within a couple of minutes you can have your first mobile app active and running on Windows Azure. Furthermore, Chervine showed the attendees that adding another user interface, like Web Sites running on ASP.NET MVC 4 only takes a couple of minutes, too. And last but not least, we rounded up the day with Windows Azure Websites and hosting of Virtual Machines presented by some members of the local Microsoft Students Partners programme. Surely, one of the big advantages using Windows Azure is the availability of pre-defined installation packages of known web applications, like WordPress, Joomla!, or Ghost. Compared to running your own web site with a traditional web hoster it is surely en par, and depending on your personal level of expertise, Windows Azure provides you more liberty in terms of configuration than maybe a shared hosting environment. Running a pre-defined web application is one thing but in case that you would like to have more control over your hosting environment it is highly advised to opt for a virtual machine. Provisioning of an Ubuntu 12.04 LTS system was very simple to do but it takes some more minutes than you might expect. So, please be patient and take your time while Windows Azure gets everything in place for you. Afterwards, you can use a SecureShell (ssh) client like Putty in case of a Linux-based machine, or Remote Desktop Services when operating a Windows Server system to log in into your virtual machine. At the end of the day we had a great Q&A session and we finalised the event with our raffle of goodies. Participation in the raffle was bound to submission of the session survey and most gratefully we had a give-away for everyone. What a nice coincidence to finish of the day. Note: All session slides (and demo codes) will be made available on the MSCC event page. Please, check the Files section over there. Q: Is it possible to upload static pages via FTP? A: Yes, you can. Have a look at the right side column on the dashboard of your website. There you'll find information about the FTP and SFTP host names. You can use any FTP client, like ie. FileZilla to log in. FTP also gives you access to your log files. Q: What are the size limitations on SQL Database? Q: What's the maximum size of a SQL Server running in a Virtual Machine? Q: How can we register for Windows Azure? Q: Can I use my own domain name for Windows Azure websites? A: Yes, you can. But this might require to upscale your account to Standard. In case that I missed a question and answer, please use the comment section at the end of the article. Thanks! And I would say Mauritius did a good job! Despite having technical presentations on Windows Azure an event like this always offers a great bunch of possibilities and opportunities to get in touch with new people in IT, have an exchange of experience with other like-minded people. As I already wrote about Communities - The importance of exchange and discussion - I had a great conversation with representatives of the University des Mascareignes which are currently embracing cloud infrastructure and cloud computing for their various campuses in the Indian Ocean. 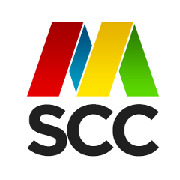 As for the MSCC it would be a great experience to stay in touch with them, and to work on upcoming, common activities. Furthermore, I had a very good conversation with Thierry and Ludovic of Microsoft IOI & FP on the necessity of user groups and IT communities here on the island. It's great to see that the MSCC is currently on a run and that local companies are sharing our thoughts on promoting IT careers and exchange of IT knowledge in such an open way. I'm also looking forward to be able to participate and to contribute on more events in the near future. We learned a lot today and there is always room for improvement! It was an awesome event and quite frankly it was a pleasure to spend the day with so many enthuastic IT people in the same room. It was a great experience to organise such event locally and participate on a global scale to support the GlyQ-IQ Technology in their research on diabetes. I was so pleased to see the involvement of new MSCC members in taking the opportunity to share and learn about the power of cloud computing. 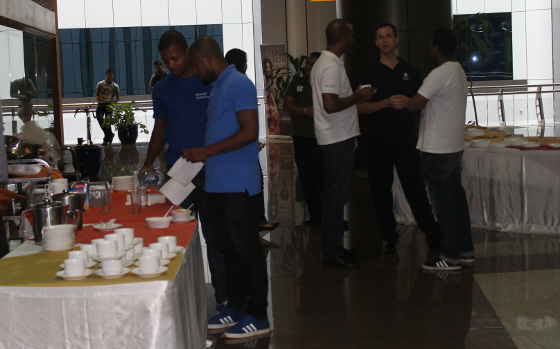 The Mauritius Software Craftsmanship Community is on the right way and this year's bootcamp on Windows Azure only marked the beginning of our journey. Thank you to our sponsors and my kudos to the MSPs! Fantastic and refreshing concept of puzzle solving. The effects and the music match very well, putting the player in the right mood to game. Get enlightened and grow your skills until you are a true God of Light. 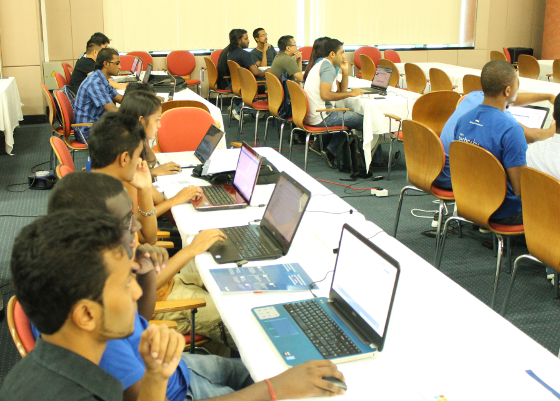 In Mauritius, the Global Windows Azure Bootcamp will be organised by Microsoft Indian Ocean Islands & French Pacific in partnership with The Mauritius Software Craftsmanship Community (MSCC) and sponsored by Microsoft, Ceridian and Emtel.